A recently blinded woman is terrorized by a trio of thugs while they search for a heroin stuffed doll they believe is in her apartment. NYTimes: It takes a long time for this fable of how three clever and diabolical thugs insinuate themselves into the St. Luke's Place arpartment of a young blind woman in search of a valuable doll to get to the point where it grabs you. It takes almost an hour and a half of playing at elaborate deceptions by the histrionic thugs, while the young woman reacts to them with obliging credulity. And many times in this enactment of dark and evil tricks being played upon the valiant and gentle woman, who has no idea where the doll is at first (it has been passed along to her unsuspecting husband, who has neglectetd to tell her about it and is not at home), there are things that seem sheer contrivance to take up running time and stretches of tedious chatter that may get on a viewer's nerves. But once this build-up is accomplished—once the sinister plot is launched and the young woman suddenly realizes that she has been duped and is in grave peril—the shock and suspense of the situation hit the audience with almost the same force, I'd imagine, as they evidently hit her. And from here on, the tension is terrific and the melodramatic action is wild as the blind woman uses all her courage and ingenuity to foil her assailants and save her life. Roger Ebert: Idiot plots usually turn up in bad movies, but occasionally they creep into superior films like this one, causing unhappy distractions. 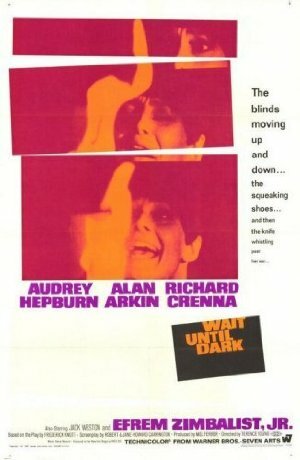 "Wait Until Dark" is about a blind girl (Audrey Hepburn) whose husband accidentally gets possession of a doll containing heroin. After she is left alone in her apartment, three men terrorize her in an attempt to find the doll. They stage an elaborate act in which one plays a cop, one plays an old college chum of her husband and the third plays -- but never mind. The important thing is, these three guys walk in and out of her apartment with complete freedom. The door is unlocked. First one guy comes in. Then he leaves and someone else turns up. Finally the girl realizes she's in danger. So far, so good. We can swallow the first hour of the movie, even though it's rather unlikely, simply because we like to be entertained and want to be convinced. But after the girl wakes up to the danger she's in, why doesn't she LOCK THAT DOOR? Slant: Terence Young’s tense cinematic adaptation so ruthlessly tightens the screws of tension that one could be forgiven for not noticing an earthquake, much less dimmed house lights. Audrey Hepburn was awarded her fifth Oscar nomination for her portrayal of Suzy Hendrix, a recently blinded NYC housewife whose husband is determined to make “the world’s champion blind lady” out of her. It doesn’t take long for Suzy to get herself in trouble when a group of con men grease their way into her apartment in an elaborate plot to locate a doll stuffed with small bags of heroin. Two are merely petty thieves, but their employer Harry Roat (Alan Arkin) is a sinister monster. Though some of the more contrived elements of Knott’s play are still intact here, Young’s presentation of Suzy’s cloistered surroundings trumps the script’s far-fetched tendencies. Like similar psychological thrillers ruminating on the theme of urban isolation and loneliness (namely The Tenant and The Seventh Victim), Wait Until Dark manages to create a paradoxical environment of civilization devoid of human life. The apartment building Suzy lives in is perpetually empty; Suzy’s husband, Sam (Efrem Zimbalist Jr.), leaves her on her own for most of the day, and the dorky young girl upstairs is apparently motherless most of the time. Also, Young makes the smart decision of setting his thriller inside a basement apartment, the cave-like arches of which have the unsettling effect of positioning Hepburn in a nondescript underground (the windows only look out on the feet of passersby, emphasizing Suzy’s disconnect from her neighborhood). It also doesn’t help that her meticulously ordered apartment is systematically thrown into disarray as the film goes on, causing her to increasingly bump into furniture and lose her balance. Once Suzy starts to catch on to the elaborate ruse and is caught calling the police by the con men, she concocts stories about children prank-calling her to say cruel things. (One gets the sense that she’s culling these deceptions from real-life past experiences.) Young’s remarkable ability to create a believable oppressive locality in Wait Until Dark obscures plot holes and irrationalities right up to the film’s extended final showdown. By the time Suzy realizes she’s completely and hopelessly alone in her apartment (she’s sent the dorky Lisa off on a futile mission to locate Sam at Asbury Park), the cumulative effect of Hepburn’s palpable desolation and Arkin’s ruthlessness (combined with Henry Mancini’s overpoweringly harrowing score) bring the film to a justly celebrated climactic bacchanalia, complete with one of suspense cinema’s first and most effective shock leaps. Watch it with someone who likes to scream. Saw this many, many years ago on VCR after reading glowing reviews, I would be interested to rewatch being a lot more familiar with movies of that vintage and with the great Audrey Hepburn. That being said, my memory of it is a movie where so much cleverness is on the side of people who are unsympathetic *and* are punching down. I like clever people in movies but it's all deployed to steal a stuffed animal from a blind person--with 3:1 odds against her at that. I never got into it. Maybe I'd appreciate the emotion more than the intellectual setup now that I'm good bit older. Maybe the tension the reviews here mention might come from seeing it a theater where you are locked into a dark space. If Charade is fake first-rate Hitchcock, this one is fake second-rate (or possibly even third-rate) Hitchcock -- in fact, back when you were reliant on cable TV programmers to catch this on an afternoon or late-night movie program, I used to get bits of it confused with "Dial M for Murder" -- not that they're actually all that much alike. Alan Arkin gives a nicely villainous performance but the basic problem is that you never get involved enough to identify with the protagonist -- while you're watching it's very much "gosh, what's he going to do to that poor blind woman next?" rather than "oh my god, there's a man in my apartment who's going to kill me." I will say, though, that the Slant reviewer above gives good advice. If you're going to watch this one, "watch it with someone who likes to scream." In my case that was always my sister, whose scream when Arkin pops out unexpectedly was nearly capable of redeeming the whole movie. Wait, are we having like, Audrey Hepburn Club? Because I would be totally behind that. This is something I think works so effectively onstage, but less so on film. I've seen several productions of Wait Until Dark in theaters, and it's done so many times because it uses a really cool, cheap trick, darkness, to thrust the audience into the same situation the protagonist is in. And then, when you think things are going to go one way...the turnaround the bad guys get is so simple that if there are audience members who don't know what's happening, they suddenly go, "OMG, I didn't think of that!" because...well, spoilers (for a really old play/movie). Wait Until Dark (the stage version) was the source of an important life lesson for me. There was an audition for a production where I was living at the time, but I knew the director, so I called him up just to ask him if he'd consider me for the Harry Roat role at all, and if I should come audition. He told me (pretty much verbatim) that the part was mine if I wanted it. Like a complete idiot, I wound up turning it down because a couple of days before I'd said yes to being in an original play that had been written and was being directed by one person, and I didn't want to be That Guy who pulled out of a play. That play wound up being one of the worst experiences of my entire theatrical life. It's a long story I won't bore you with right now, but I learned that some times it's more than okay to be That Guy.